fuel cell car on the Honda stand at the show. sporty and fun to drive." actually extends into the cabin between the seats. the wheel arches to look more like a part of the original body. instruments in direct line-of-sight of the driver. 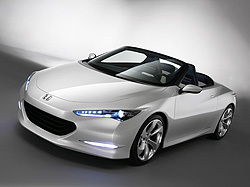 Honda unveils OSM study model at the British International Motor Show. Wow! the car looks really good.Its a good news.Thanks for all the details and history you provided. Oh ya the car looks so beautiful.Thanks for the pics and information about it.I liked it.